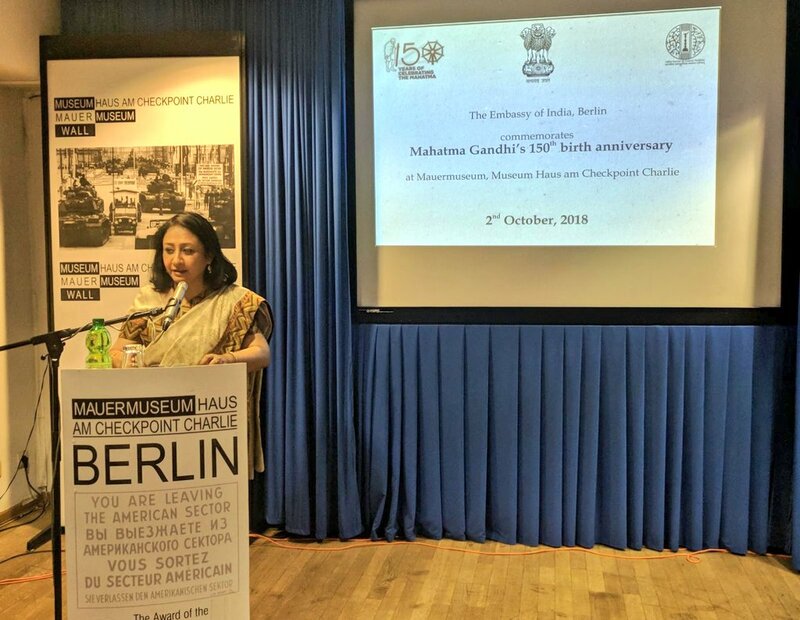 Embassy of India, Berlin, began a two-year long commemoration (from October 2, 2018 to October 2, 2020) of the 150th birth anniversary of Mahatma Gandhi with a homage ceremony at the iconic Mauer Museum Haus at Checkpoint Charlie today. 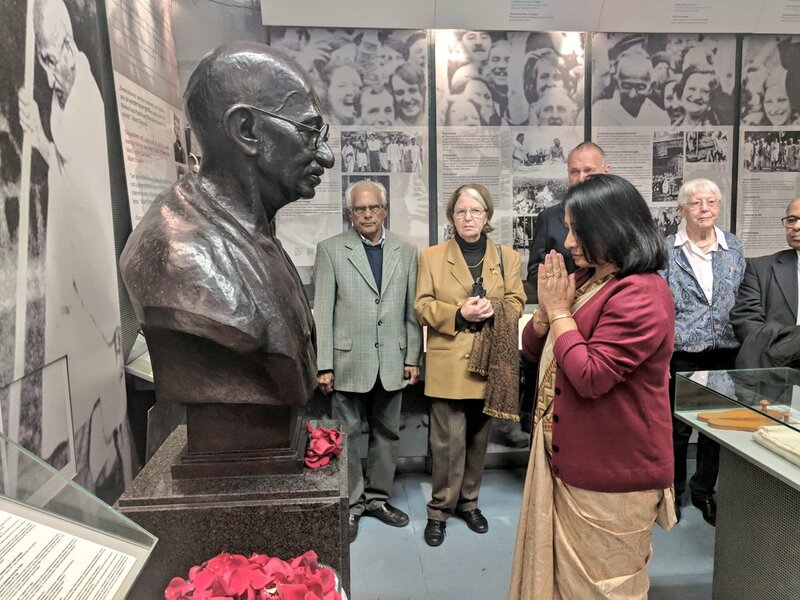 Ambassador of India to Germany, Mrs. Mukta Dutta Tomar, paid homage by offering floral tributes at the bust of Gandhiji at the Mauer Museum, along with Director of Mauer Museum, Ms. Alexandra Hildebrandt and other attendees that included members of the diplomatic corps and the Indian community among others. Director Ms Hildebrandt, in her welcome address, described the bust of Gandhiji as the Museum’s most prized possession. 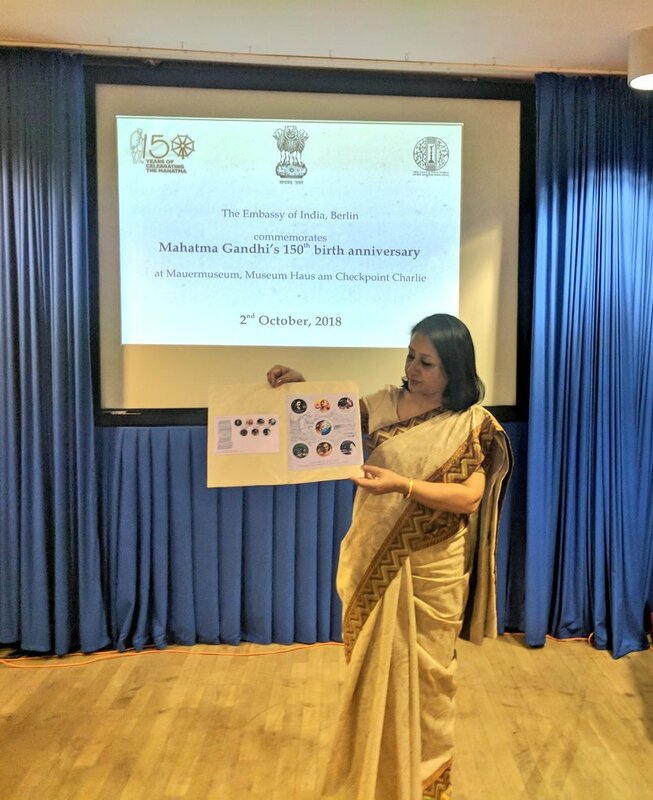 Commemorative stamps on the life of Mahatma Gandhi were released by India’s Prime Minister, Shri Narendra Modi, earlier in the day in New Delhi. These commemorative stamps were unveiled at the ceremony by Ambassador Tomar. 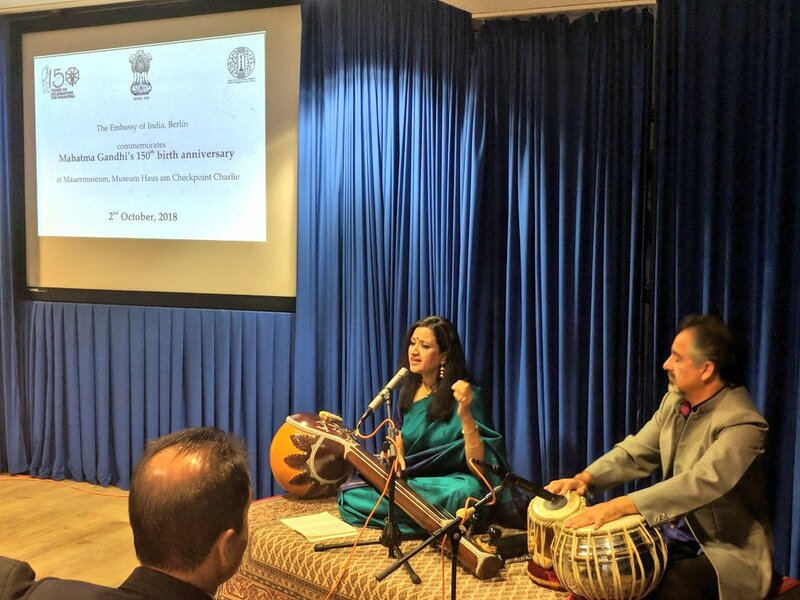 A short video produced by the Embassy of India, Berlin, of the rendition of a spiritual song or ‘bhajan’ which was a favourite of Mahatma Gandhi was released on the occasion. The ‘bhajan’ titled ‘Vaishnava jana to’ has been sung by German actress and singer Alexandra Marisa Wilcke and is available on Embassy of India, Berlin’s Facebook page. Accomplished North Indian classical vocalist Jyotika Dayal Paust, accompanied by Ravi Srinivasan on the tabla, presented favourite ‘bhajans’ of Gandhiji which had the audience join in with great enthusiasm. As part of the series of commemorative events on the 150th birth anniversary of Mahatma Gandhi in Germany, an online quiz competition was launched today on Twitter (@eoiberlin) and Facebook (@indiaingermany) of the Embassy of India, Berlin. The online quiz will be held over the next one year with attractive prizes for the winners. 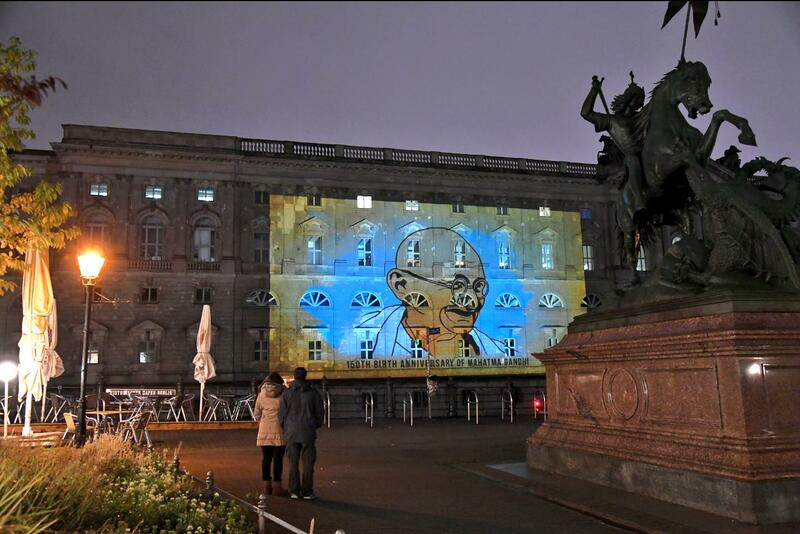 Berliners will also be able to have a glimpse into the life and ideals of Mahatma Gandhi through a large-scale video projection that will be screened at Spreeufer at Nikolaiviertel on October 2 and 3 from 19.30 – 23.00 hrs.